Sail to Isla Mujeres on the double-decker 'Caribbean Cabaret'. The party begins with an open bar which lasts all night. Arrive to the beautiful Private Beach Club 'El Pescador' for a delicious all you can eat dinner buffet. 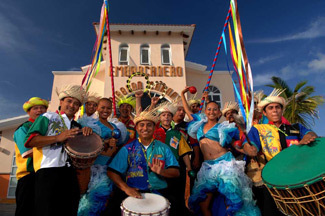 Then particpate in the most exciting Caribbean tropical carnival show with games and prizes. Party all the way back to Cancun with great music, entertainment and dancing, and of course open bar.